How and why patients develop Urologic Chronic Pelvic Pain Syndromes (UCPPS). How UCPPS changes over time. How genes, behavior, lifestyle, and environment contribute to what causes UCPPS. How differences in brain structure and function may relate to differences in the experience of pain. Whether biological samples contain biomarkers, which can identify the presence of these conditions. Whether experiencing chronic pain in one area of the body affects pain in a different area of the body. One year with an option to extend participation afterwards for up to 5 years. Answering a series of questionnaires about bladder and urologic symptoms, personality and moods, stress, fatigue, sleep, and other factors that could influence UCPPS. A blood draw, cheek cell swab, and urine collections. Two more in-person visits at 6 months and 12 months after the baseline visit. Bi-weekly online questionnaires about bladder pain and urinary symptoms. 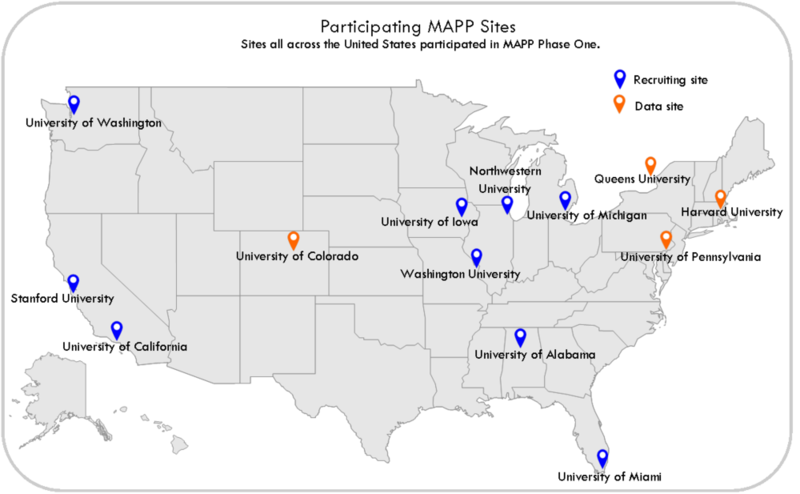 The MAPP 1 study ended on June 2014. A group of participants agreed to keep in touch via online surveys done every 4 months. Some discovery sites developed a study that would be completed alongside the main study. Our University of Washington site saw the potential of twin research to also provide insights on chronic pelvic pain. In partnership with the University of Washington Twin Registry, we developed a unique site-specific project of studying chronic pelvic pain in female twin pairs. Identical twins share the same genes (DNA) and fraternal twins share about half of their genes. Comparing the development of chronic pelvic pain between twin pairs can help decipher how DNA and the environment contribute to this condition. The twin study was conducted alongside the main MAPP study. It focused on the same factors, but added the power that twin research provides.